Admiral’s Walk, built in 1983, is comprised of two buildings, each standing 11 stories tall. Its poured concrete architecture was very avant garde at that time. There are a total of 297 residential condominiums ranging in size from 1-bedroom to 3-bedrooms. In addition, there are 4 commercial units (a dentist’s office, an interior decorator, a beauty salon and a plastic surgery center.). These are large apartments, many of which have been beautifully renovated. Most windows are floor-to ceiling, with sliders to the generously sized balconies. 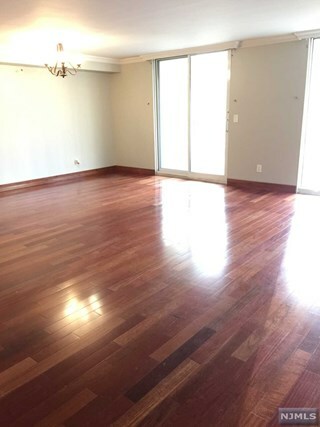 One bedroom units are 1,083 square feet with a 200 foot balcony and all have 1 1/2 baths. The two bedroom units, most of which face the Hudson River and NYC are between 1,350-1,550 square feet with an additional 300 square feet of balcony space. The three bedrooms are 1,715 square feet with 350 square feet of balconies. The Admiral's Walk life-style can be summed up as waterfront casual. Admiral's Walk sits on almost 9 acres of Hudson River waterfront property. It is the only waterfront condominium with a grandfathered private walkway. It is on this walkway that there are walking paths and picnic and barbecue areas as well as The "Pavilion" which is a two-level building with a renovated gym on the bottom level (facing The River, of course) and a party/meeting room with dance floor and full kitchen on the second level. The Pavilion party room is available for residents of the community to rent for private parties for a modest charge. All residences have large walk-in storage closets, large eat-in kitchens and separate dining rooms. Each has a Master Suite with separate bath and shower. Every condo has 1 assigned outdoor parking space. 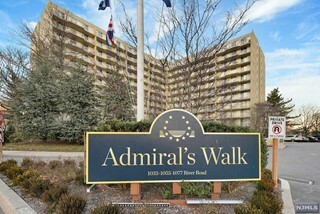 Others can be rented from the Admiral’s Walk Condominium Association. There are 100 covered, owned parking spaces that can be purchased or rented from the owners, if available. The actual apartments are huge by today’s standards. Terraces span the length of every apartment. All units have entrance foyers, large eat-in-kitchens and lots of storage space. One bedroom units are 1,083 square feet with 1 ½ bathrooms and some are end units with an extra window in the kitchen. There are 3 different 2-bedroom units, all with 2 full bathrooms. They range in size from 1,325 to 1,549 square feet. The 3-bedroom units, every one of which is an end unit, have the largest eat-in-kitchens with windows and 2 ½ bathrooms. They are each 1,715 square feet. Terrace square footage is additional. All units have floor-to-ceiling windows and sliders, walk-in closets, storage closets and a washer/dryer. Just outside the door of your Admiral’s Walk Condominium are 2 NJ Transit bus stops. The #158 bus is just across the street. The #188 bus (with service to the New York side of the GW Bridge) or West New York also stops here. Commuter ferry service to NYC is steps away at the Edgewater Marina. It whisks passengers to NYC on a short 12 minute, scenic ride. 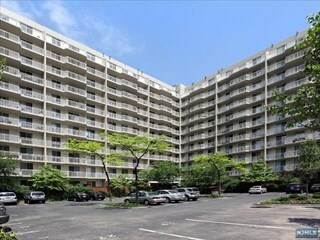 All major highways, The George Washington Bridge and the Lincoln Tunnel are within a few miles from Admiral’s Walk. Admiral's Walk is a full-service gated community with a 24 hour gatehouse. concierge service that includes mail and package delivery service, a Bike Room, Outdoor Pool open Memorial Day through Labor Day, outdoor jacuzzi, 2 lighted Tennis Courts, Basketball Court, Fitness Center and a Community Center (Pavilion) with kitchen and dance floor ideal for private parties or just lounging and on-site management.. As noted, there is a private tree-lined Walkway with picnic tables and barbecue area. Each residence is assigned one outdoor parking spot. Additional spots available at $75/month. There is a full time maintenance staff, porters and on-site management.